Home > Law Books > Practice Materials > Electronic Discovery and Records and Information Management Guide: Rules, Checklists and Forms, 2018-2019 ed. Electronic Discovery and Records and Information Management Guide: Rules, Checklists and Forms, 2018-2019 ed. 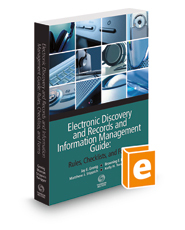 Electronic Discovery and Records Management Guide: Rules, Checklists and Forms takes a proactive approach to discovery of electronically stored information. Proper planning in advance of possible discovery can greatly reduce the costs and burden of complying with discovery requests. Thus, initial emphasis is given to records management, which is important for both plaintiffs and defendants.